Reason: Do I really need reasons anymore? There are times in life when you just want something basic. Something average. Something standard. But not on this journey, we demand the best and when it comes to Standard Brewing, only the name is standard. 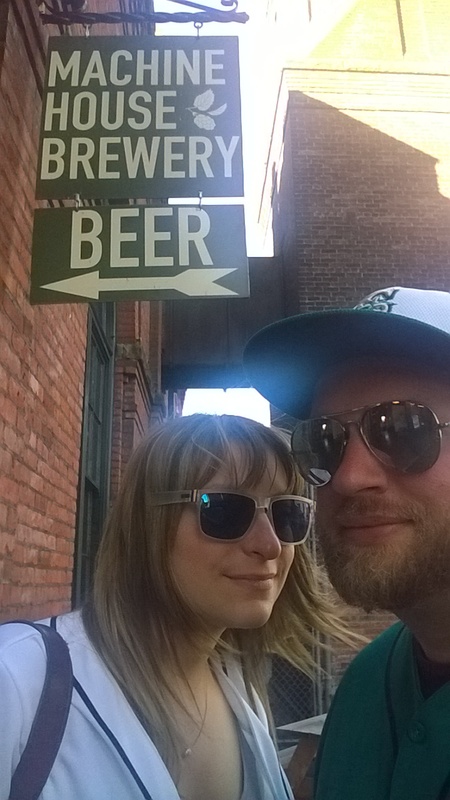 Located on Jackson Ave in Seattle in a renovated house, Standard Brewery boosts a fantastic outside drinking area. That is mostly due to the fact that the inside of the brewery is pretty small. But the outside has several heaters, partially undercover and has a great craft brewery feel to it. Standard has come a long way in the past few years. When I first visited, they had a very small selection but in the last year, they have put a lot of time, effort and money to expanding their brewery and now they have 10 or so different types of beers on tap. One of the first things I like to do when I visit breweries is taste their lighter beers and I do this for a reason. Dark beers, while delicious, have such a rich and dominating body that it is difficult to taste any imperfections in the beer. But when you taste their lighter beers, it is much more difficult to hid any problems. You can taste the body, the hops, smell the aroma. Get a really good feel for the talent of the brewery. And when you go to Standard, you’ll notice that the brewery has tremendous talent. I highly recommend the Mosaic Single Hop, the Jerry of the Day and if they still have it, their Wet Hopped Pale Ale. All of them blend the hops and malt together perfectly to create a well balanced beer. Especially the Jerry of the Day if you love those the tropical flavor of Azacca and Simcoe hops. Standard also has a West Coast IPA (tropical and light), CDA (piney), and Rye IPA (dank and rye). And these are the ones that I’ve had. Standard has such a diverse selection there is a beer for anyone who wants to visit. If you want something more than standard, visit Standard Brewery. You wont be disappointed. Just make sure to bring a jacket. Reason: Grand re-opening of new location! Welcome to Georgetown, Lowercase Brewing! After a few months of getting permits and fighting the bureaucracy that is Seattle it is wonderful to see your beautiful doors open once again. No journey is ever complete without visiting the nice folks at Lowercase Brewing. Starting off in South Park area of Seattle, Lowercase made the long and arduous trek all the way to Georgetown and moved into an old welding building. And I know what you’re thinking, “Old welding building?!? Awesome!” and it is! Roll up doors, large outdoor seating area with incandescent lights hanging and wood accents all throughout the brewery. The beer itself is very traditional. As in, when you order a beer from them, expect it to taste like you think that style should be. Their ESB tastes like an ESB, their pale taste like a pale. Which is wonderful because you know exactly what you’re going to get and if you enjoy a certain style, you’re going to love their beer. Also, get the shandy. It’s probably my favorite. They carbonate their lemonade/limeade so when you combine it with either their pale or Mexican lager you’re going to get a refreshing low alcohol beer with POP! Wonderful brewery, with wonderful beer. Head to Georgetown and have a fun night. The brewery is on airport way, just south of all the bars and restaurants in that area. As we slow down and take our time with this journey we notice something unique happening. In the far distance we notice a beautiful sound being emitted from a friendly building. As we get closer, we notice that the decibels are getting higher and higher. Once we get to the source of the divine tone, we instantly fell in love. We have arrived at Decibel Brewing. I love being able to go to soft openings of brewers. It makes me feel like I am part of the ‘in’ crowd. I got an email early last week from the guys at Decibel inviting myself and any of my friends to check out the soft opening of the brewery. So obviously Sam-wise and I, plus 2 of our friends headed that way. The brewery itself is in a nondescript building, nestled snugly to an auto body shop. Once you walk into the brewery, you’ll notice a bar lined with Christmas lights and wide open spaces. On the far back wall you’ll see all the people who supported the brewery via the kickstarter campaign. While you there, look for the handsome ‘Holt’ on the wall. I know what people really want to read about though, the beer. I really enjoyed the beer. Although I was very disappointed that they ran out of pale before I arrived, but I’m sure I can forgive them. They’re brewing on a 2 barrel system, which means they’ll occasionally run out of a certain beer. But they still had 7 others on tap, which shows that they have been prepping for this soft opening for a while. When I encounter soft openings, usually there are a handful of beers, but 7 is very very impressive. The beers they had were an IPA, Cream, Belgium Farmhouse, Stout, Alt, Dark Ale, and Wit. Sam was a big fan of the IPA and Cream ale. I didn’t get around to the IPA (Very weird, but shush), but I enjoyed the cream thoroughly. It had a nice foaming feel to it with just a hint of the butteryness you can get from pilsner malt. Very tasty. I also enjoy the Alt, which really reminds me of the classic German flavor, a bit sweet with a malty body. If you’re in the Bothell area why not check out Decibel (Or in Mill Creek since they’re right there too!). Seattle beer week is a magical time when breweries and bars across Seattle celebrate our wonderful tradition of making some of the best beer around. From Tacoma to Everett – the Seattle metropolitan area is littered with fantastic breweries that have a myriad of delicious beers. It is a wonderful time to be a beer snob. Now is the time to support local craft breweries, and the creative, often wonderful, beers they provide. Rye. For centuries it has been associated with whiskey, especially in the United States. Rye Whiskey is a popular alternative to Bourbon. The rye gives a more powerful, bold, spicy body to the whiskey. It is a wonderful change of pace for whiskey drinkers, especially if you love Islay Scotch or Whiskey with less fruit or floral flavors. But alas, this isn’t a whiskey blog (Although, I do love me some whiskey). This is a beer blog, and we are here to talk some rye beer. During this past Seattle Beer Week, Reuben’s brewing in Ballard accepted the challenge to create a rye beer for every palate. Why rye? Like in the use of whiskey, rye gives a completely different flavor profile and that provides a subtle but noticeable difference. IPAs are known for their hoppy finish, but when you create a RYE-PA you’ll still have that hoppy finish, but you’ll notice a completely different body, which may or may not be your style but it’s worth a shot. Reuben’s makes tremendous beers. The brewery is insanely popular for a reason, and I love the idea of them having an RyeFest, something different than the norm. This year’s RyeFest had 14 or so rye beers on tap, ranging from Rye Shandys to Kentucky Commons to a Rye beer made with Earl Grey Tea. A couple of them really stood out to me, first was the Imperial Rye IPA. This rye really packed a punch with hints of floral and citrus from the hops, but the rye body which gives it a different flavor from imperial IPAs made with all barley. At 8.4% abv and 100 IBUs, this was something I wish I could have had a pint of, but since I had to drive, a taster would suffice. Another beer that really stood out was the Tropical Rye Shandy. I know… I know… Rye shandy?! HAVE THEY GONE MAD?! Well, maybe, but it was delicious. With a tropical nose and taste, but with a different spicier body than your usual shandy, it’s a great take on a summer classic. At the end of the day, it was a wonderful RyeFest. Next year will be the 5th year they do it and I highly suggest you come out to Ballard and enjoy the rye. There is a time in everyone’s life where they have to make the difficult decision. For many it is, “Do I want a cask beer”? Well, in our journey that question was answered for us, by Machine House. Machine house is in an awesome location (Georgetown) in an awesome building (ITS MADE OF BRICK!) and more importantly, it is all cask beer. Sam and I enter with hesitation. Well, not me, I ran across the street and into the brewery. But Sam was hesitant, since she isn’t the biggest cask beer person in the world. Sam was also hungry. And you don’t mess with Sam when she is hungry. So we ordered a few cask beers and then I ran down the street to a neat little sandwich shop and got Sam some food. For those who do not know, cask beer is a unique experience. Since you usually drink cask beer closer to room temperature. I’m sure you’re asking yourself, “So its just English beer!” Well, yes – but also no. True, many English style ales are cask beers, since it just works that way. But cask beer is about the way it is created. Beer is carbonated and pressurized with COs (Or nitrogen for those Guinness type), but cask beer isn’t done that way, it is more natural. When beer is done fermenting, it is transferred into a keg and carbonated (Not always, but lets keep it simple). Cask is when the beer is poured into a cask, in its natural form and from there (Again, keeping it simple) eventually gets poured into our stomachs. Because it isn’t chilled and carbonated, it will tend to be a bit more warm and wayyyyyy smooth. Many breweries will do a “Cask tuesday/wednesday/etc”. Or you can just go to Machine house. 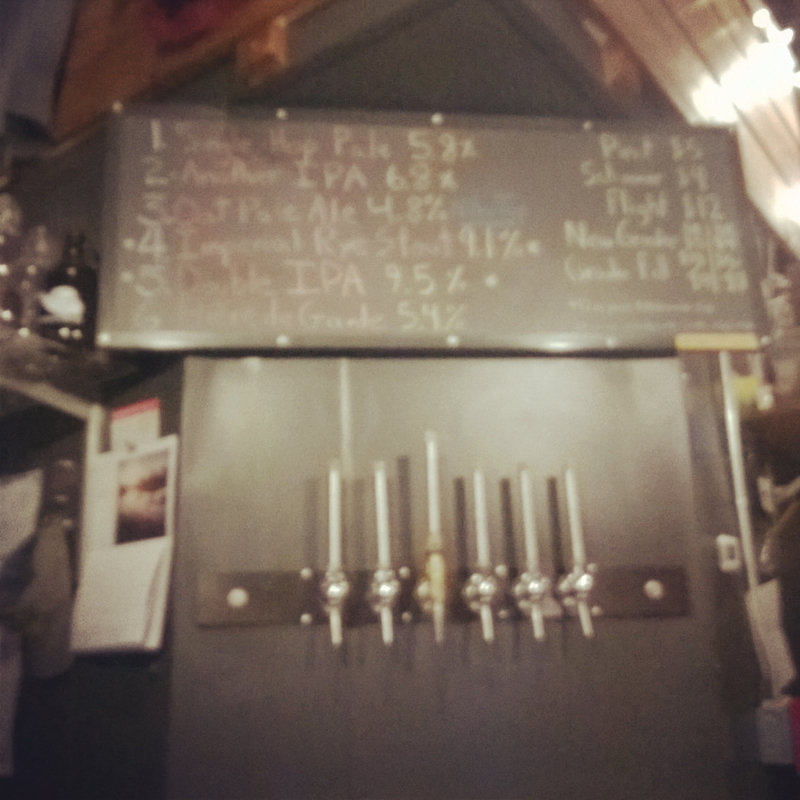 They had 6 or so cask beers on tap. All of which were good. I had the gold, best bitter and brambling IPA. I was a big fan of the IPA and bitter, those just work perfectly with cask beer. Sam was not as impressed, but was a trooper and still had a few beers. Regardless, just go and try a cask beer. You won’t regret it! Reason: Its called Flying Lion. Why the hell not? There we were, face to face with the illustrious flying lion. We circle each other, I’m gazing into the soul of the immortal flying lion. I stab left, the flying lion shifts. He claws at my face, I scramble to my side, barely avoiding death. We are at an impasse. Either not sure what the next move should be. So I do something brave and risque, I order a pint. A delicious pint. The Flying Lion obliges. We sit down and talk. We aren’t enemies, but friends in the journey that is life. I have much to write about Flying Lion Brewing. And all of it is good. Before we get to the beer, lets talk about the brewery and brewer. Occasionally, I come across a brewery and think to myself, “Oh come on”. The brewery has been open for about the year, and the brewer Griffin is in his mid 20s. Yeah, basically everything I’ve wanted to do with my life, he is doing, about 6 years younger. 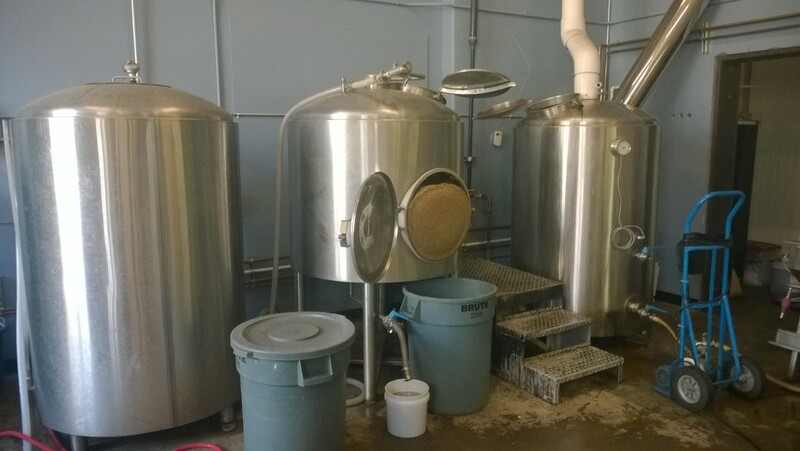 From what he told me, he started homebrewing early, and with a supportive family, they were able to open a brewery in the Columbia City area of Seattle. Good for that guy. Another awesome thing he does it grinds all his grain via bike. Most breweries either have their own mill, or have places like Larrys Homebrew in Kent do it for him. But being in his 20s and full of energy, Griffin does it himself. Amazing. Now lets get to the beer. I’m a huge fan of the brewery. The beer is really good, but you can find great beer almost everywhere. What makes the brewery is the feel of it and getting to talk to the brewer. He has such a passion for his craft and loves it, and as odd as it sounds, you can taste the passion and love in the beer. Think of it has your moms home cooking, it is the love that makes it better. Now I’ve had most of the beers here, and I like em all. The single hop pale and the IPA were my highest rated beers. I wasn’t the biggest fan of the amber, but it was more cause it wasn’t my style of amber. I like mine with a lot of body, it was just lacking a bit, but I know many people will love it.